What is the Acer Predator Z1? Add an extra level to your gaming experience! For those of us of a certain age, the monitor we used for gaming on our PC used to be a great beast of a thing, CRT technology and probably only had a 15” screen size. It did the job, but it was nothing special and it didn’t really need to be back then as we knew no better and the games didn’t demand anything superior. Back in the late 90s, moving just 2” up to a 17” CRT monitor would see the price more than double compared to a 15” model. Thankfully technology has improved and for those gaming on their PC today, the choice of monitors is huge and varied with prices ranging from under £100 to over £1000 for one with all the bells and whistles. 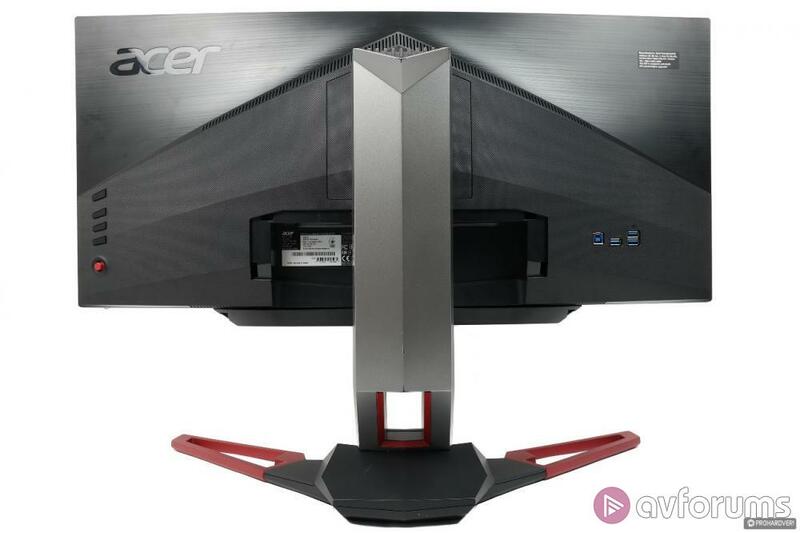 Released in March 2017, the Acer Predator Z1 (Z301CT) Monitor doesn't appear to be that widely available. The non Tobii Z301C version is available for around £750 but we could only really find the Z301CT on eBay from Scan's eBay outlet for £620 which is quite a steal at that price. The HDMI connection will only allow up to 60Hz, so to benefit from the lightning fast 200Hz refresh rate you will need to use the display port connection. 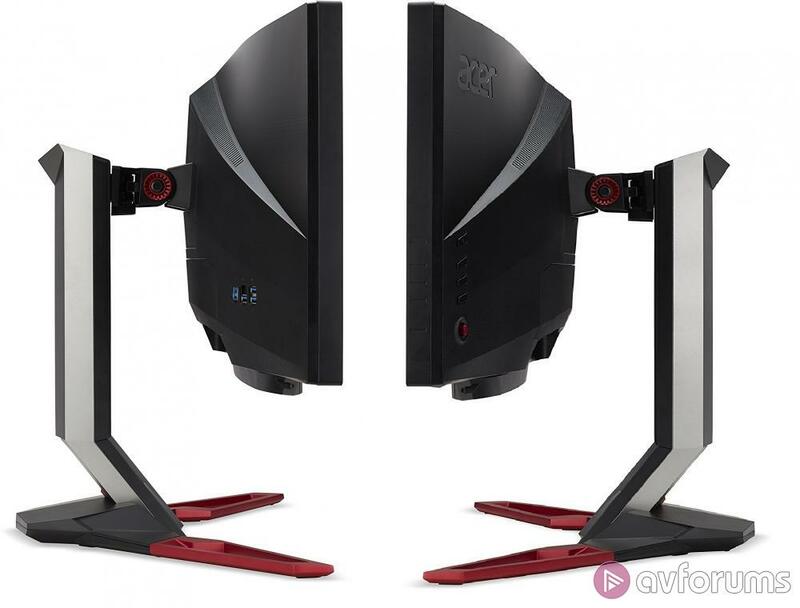 For those familiar with Acer's Predator monitors, the Z1 follows the same Predator design theme with occasional flashes of red to break up the black on the stylish looking stand. The 29.5” curved screen has a fairly thick bezel which is even thicker along the bottom edge and includes the Tobii eye tracking system which does look like it has just been stuck to the bottom of the monitor. The Predator logo along the bottom is about the only thing breaking up the black. It’s average as far as monitor design goes, but then you don’t really need a garish looking monitor when your eyes should just be focused on the screen itself. There are no buttons along the front or bottom of the monitor, just a small LED light which illuminates blue when on and amber when in standby. The controls are all to the rear and aren’t the easiest to use. You have a joystick style controller for navigating the menus along with four main buttons for power, hot key 1 and 2 and input button. The monitor is of course VESA mount compatible, despite the curved screen and weighs just under 10kg. The stand is versatile and includes tilt, pan and height adjustment so you should be able to get this in the exact position you require. The height adjustment ranges from around 70mm from the bottom of the monitor to the desk at its lowest position to 180mm at its highest. The dimensions of the monitor including the stand are 713mm wide x 255mm deep x 410mm high. As with most monitors of this class these days it acts as a USB hub so includes the USB 3.0 (upstream) port and 4 x USB 3.0 ports. The other connections are the Display Port, HDMI 1.4 and audio. All the cables are included in the box so you shouldn’t require anything to get it all setup and running. The menus are quite extensive and allow for a good degree of customisation, although the controls with the single joystick as the main input device is not the easiest to use. The quick access menu via the buttons on the rear allows you to quickly change the brightness and volume along with the display input. The brightness and volume buttons can also be changed to contrast, blue light, input, saturate, od or gamma via the full menu. 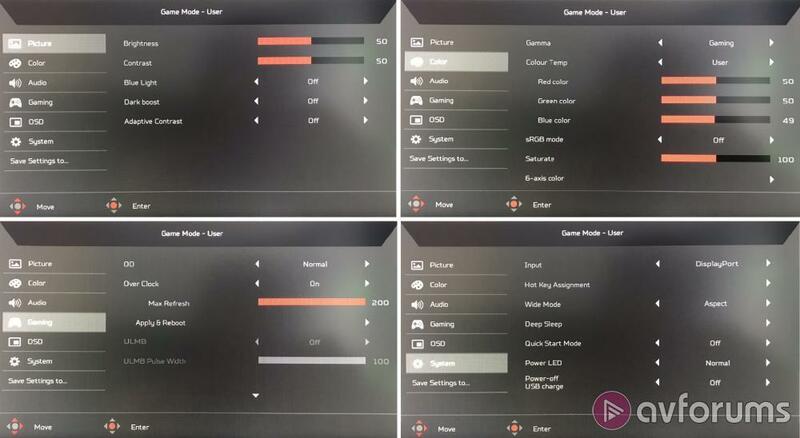 Within the menu system you can configure the basic picture settings along with more advanced settings such as colour temperature and 6-axis colour. Other settings include configuring the overclock, on screen display, power-off USB charge and even dimming the tiny Power LED light if it gets too annoying. For our monitor calibrations we use SpectraCal software and a C3 Colorimeter. The screenshot below shows the pre and post calibration results. The maximum screen luminance detected was a 319.6 cd/m2. Following calibration we reduced this to a more manageable 213.4 cd/m2. Out of the box the monitor was already very good although the colour accuracy was a little off, with a ColorChecker error of 2.28 and Greyscale error of 2.53. A level of less than 3 is normally the target, which this monitor impressively achieved out of the box. Following a successful calibration, we were able to reduce the ColorChecker error to a superb 0.48 and GreyScale error to 0.50. An excellent result aided by the available configuration settings in the monitor’s menu system. For our testing we use a Leo Bodnar input lag tester. This measures the delay (latency) that it takes a video signal to pass from the point of input until it is displayed on the monitor. With the Z1 we get a result of 16.5ms. This is a very good score, but perhaps we could have expected better from a Predator monitor. For example, our own Acer Predator XB271HU gaming monitor has an input lag of 12.2ms whilst the Dell P4317Q we reviewed recently comes out with an excellent 10.5ms. Note that input lag is not response time. Response time is usually the number monitor manufacturers push the most in their advertising, such as ‘very low 2ms’ for example. Response time is how quickly a display can change its pixels from black to white or grey to grey. A high response time will mean you are more likely to see ghosting, which is the blurring that you see behind fast moving objects. The Z1 has a decent response time of 4ms. It’s not the lowest you will find on a gaming monitor as some of the latest Predator monitors have a response time of just 1ms. It is a number that can’t be taken in isolation and does need to be combined with the input lag to get the best idea of how well a monitor will perform. Monitor manufacturers never display the input lag, with gaming for example a monitor with a 1ms response time but a 60ms input lag will likely offer worse performance than one with a 4ms response time and a 16ms input lag. Onto the display quality itself there is no getting around the fact that this is just a 1080 resolution monitor. It may benefit from the ultra-wide display but given the 29.5” screen size it is immediately noticeable when going from a 1440P standard width monitor to this one. Putting that aside, the extra width for web browsing is wasted, although multitasking is where this would work well, you could for example be browsing AVForums on one half and have YouTube on the other. The black levels were excellent showing a very deep black with a noticeable lack of grey. Contrast levels were spot on and ghosting appeared minimal during our gaming and static tests. Text appears clear and precise along with excellent colour reproduction and vibrant images. Testing with various ultrawide videos does highlight that this monitor performs well despite the 1080p resolution. Out of the box and during testing we had no dead or stuck pixels and no backlight bleed at all. The viewing angles were not great though, as the screen is curved your best position is directly in front of it, viewing at an angle the gamma curve of the monitor becomes very apparent. As this is a gaming monitor this is where it comes into its own. The ultrawide curved display is an immediate improvement in every game we tested. The level of immersion is increased thanks to the curve and whilst the vertical field of view will be the same when compared to a standard width monitor, the horizontal field of view is increased. This allows you to see more of the game area and should be a benefit if you play lots of FPS games. We couldn’t find a game on our PC where it didn’t benefit from the ultra-wide display. Depending on your PC specification, the 2560 x 1080 resolution may not be a bad limit as to get the most out of the 200Hz refresh rate you will need a very beefy PC as it is. Even with a graphically undemanding game such as Rocket League, with our GTX1070 we could only achieve a frame rate in the high 180s with the settings on maximum. A GTX1080 is likely to be required if you want to play the latest games on high settings and get close to the 200FPS limit. Thanks to the G-Sync technology and the refresh rate coupled with the input lag we suffered no issues such as screen tearing or any ghosting, the monitor performed superbly for game play. Looking at the Z1’s specifications and features we fully expected the Tobii Eye Tracking module would be one of those gimmicky add-ons that you find included in products but one you are never likely to use and also one that doesn’t really work very well. We couldn’t have been more wrong. Firstly the Tobii Eye Tracking module comes prefixed to the underside of the monitor. From a design point of view, it does look like it was an afterthought rather than fully integrated, but that’s not really an issue. With the Eye Tracking turned on you do see various red lights along the bottom of the monitor. Once you’ve installed the various Tobii software such as the Core software and game hub, you then run through the initial setup and calibration which immediately brings home just how accurate the system is at tracking where you are looking. Once that is all finished you can then start using it. The gaming support is limited currently, but more games are being added to it all the time. Far Cry 5 for example is supported by Tobii along with titles such as Rise of The Tomb Raider, Assassins Creed: Origins, F1 2017, Watch Dogs 2 and about 100+ other games including Euro Truck Simulator 2 and American Truck Simulator. Features across many games, in particular action titles, are items such as ‘aim at gaze’, ‘throw at gaze’ and ‘extended view’. Testing with Rise of The Tomb Raider, the ‘aim at gaze’ feature worked superbly and feels as if you have engaged a hack. If an enemy appears you simply look at their head, press the aim button on the mouse, the crosshair snaps to their head, you fire and they are dead. It really did work very well and it is understandable why none of the major FPS games are supported by this, playing against someone with the eye tracking enabled you would quite easily think they were hacking. Many of the games have eye tracking features developed specifically for them such as with the latest Far Cry 5. These features include ‘enemy tagging’, where you automatically tag enemies just by looking at them, ‘aim at gaze’ which does the same as we mentioned above with the Tomb Raider game, ‘Dynamic light’ which adapts the lighting to your focus point and in the Guns for Hire mode it shows your allies where to move simply by pointing with your gaze. As well as for gaming, eye tracking technology is also of a huge benefit to those with disabilities. Tobii have developed a lot of software for people to control Windows and other software simply by looking at it without the need for a keyboard or mouse. Should I buy the Acer Predator Z1 (Z301CT)? 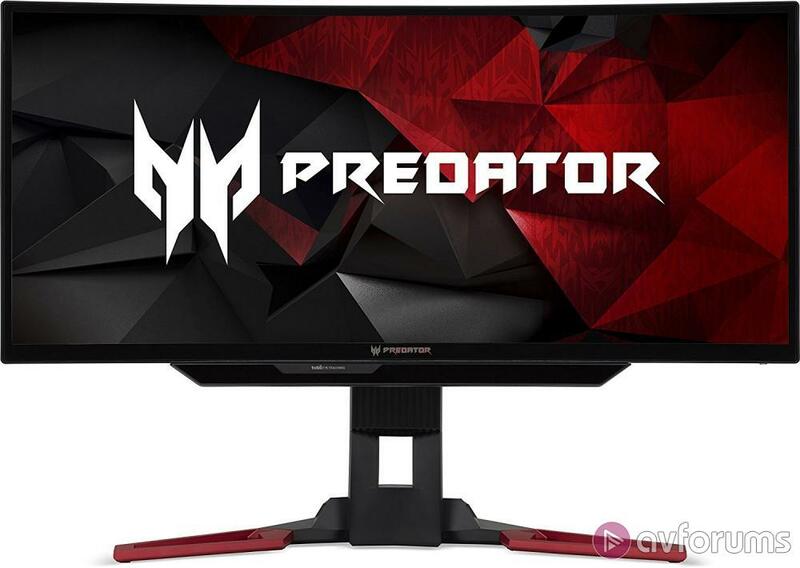 The Acer Predator Z1 (Z301CT) offers an impressive specification and is jam packed with features including a curved 29.5” 2560 x 1080 display, 200Hz refresh rate, 4ms response time, Nvidia G-Sync and Tobii Eye Tracking. The 1800R curved display is of particular benefit for gaming as it gives an increased immersion level and allows for you to see a lot more of the game area. The out of the box display calibration was excellent, and this was improved further following our calibration thanks to the available options in the rather fiddly to control menu system. The input lag was good at 16.5ms and didn’t present any issues. The Tobii Eye Tracking System worked superbly and is not just a gimmick, it added some impressive features to the games that are supported. Competition for the array of features seen here is limited, one likely candidate is LG’s impressively priced 34UC89G which has a large 34” size and includes G-Sync for just £599 but doesn’t have the 200Hz refresh rate or the Tobii eye tracking module. To fully match the specification of the Z1 there doesn’t appear to be a lot of candidates at all mainly because the Tobii system is currently only on a few select Acer Predator monitors. If you are looking for an ultrawide monitor with a curved screen, G-Sync and a lightning fast refresh rate it does seem that the Acer Predator Z1 is still one worthy of your consideration even if it does only have a vertical resolution of only 1080 pixels. Providing you can find somewhere that sells it of course. Write your Acer Predator Z1 Monitor review.